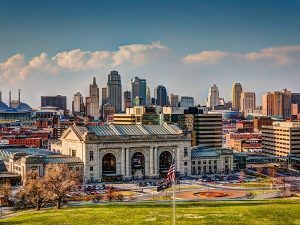 Your adventure starts at the River Market as you make your way to Union Station and all points in between…enjoying these Kansas City attractions! More than 200 tons of treasure recovered from the sunken 1856 Steamboat Arabia, including china, jewelry, hardware and food. Open 10am-5:30pm Mon.-Sat., noon-5pm Sun., Winter hours (Jan.-March) last tour at 3pm closes at 4:30pm. Last tour begins 1½ hours before closing time. The River Market is a riverfront neighborhood in Kansas City, Missouri that comprises the first and oldest incorporated district in Kansas City. Over the years, the River Market has also been known as Westport Landing, the City Market, and River Quay. The River Market stretches north of the downtown Interstate 70 loop to the Missouri River, and is bordered by the Broadway Bridge on the west and the Heart of America Bridge on the east. Coming to Crown Center Spring 2012! SEA LIFE Kansas City Aquarium will transport you into the amazing underwater world. Come nose to nose with sharks and prepare for astonishingly close views of everything from humble starfish and seahorses to graceful rays. To get any closer you’d have to get wet! The National World War I Museum and Memorial is America’s leading institution dedicated to remembering, interpreting and understanding the Great War and its enduring impact on the global community. See history come to life as you experience the sights and sounds of the past. Take in all the sites by utilizing Kansas City’s new state of the art Streetcar service! For additional “Things to Do” please visit www.VisitKC.com. Be sure to check out the Calendar of Events and Deals & Special Offers savings links.